I know that this isn't technically baking, but I just had to share this with you all. If you're all about the spicy flavours that come with Christmas, like ginger and cinnamon, then this is right up your street. This is GoodFood's Mulling Syrup and honestly, it's like Christmas in a bottle. My mum discovered the recipe, gave it a go and said it was amazing, so naturally, I had to try it for myself. It's so bloody delicious that it would be criminal to keep it from you guys. It's really easy to make, but it won't last long as you'll just keep going back for more! I realise that it's called a syrup, but don't be put off by how watery this stuff is. Yes, a syrup is meant to be thick, and this recipe contains sugar, so it technically is a syrup, just without the thick consistency. The wateriness works perfectly for it though, because I think this guy works best in drinks. If you pour 100ml into a jug, followed by 200ml of apple juice, pop it into the microwave for 3 minutes, pour it into a mug, and voila! 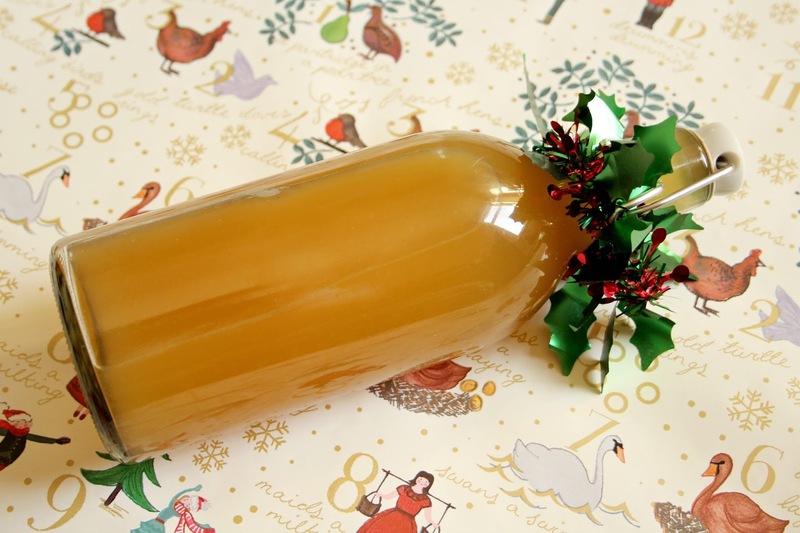 Non-alcoholic mulled cider. Perhaps one of the most delicious things I think I've ever made in my own home! Or you can try it with red wine for Christmassy mulled wine. Put all the ingredients (yep, all of them!) into a saucepan with 1 litre of water and bring slowly to a simmer, making sure all the sugar has been completely dissolved. Turn down the heat and allow the mixture to simmer for 20 minutes. Leave it to cool, then strain through a very fine sieve or muslin cloth. And that is literally it! It is so so easy to make and so delicious. It would also make the perfect gift for anyone who is a big fan of Christmas! My bottle is 500ml (so you will get 5 portions if used in drinks) and £1 from Ikea, but there are plenty of other options out there. You could tie some ribbon around the top and attach some cinnamon sticks with a note on your favourite way to use the syrup, whether it be in cider, wine, baking or over the top of ice cream! This will be the perfect thing to drink on Christmas Eve with a cosy pair of slippers on and a Christmas film, so I'm definitely going to have to stock up as I can't see my bottles lasting much longer!